It is time for another Moms of Master Books review. This time, I'm fortunate enough to be reviewing a wonderful John Hudson Tiner title, Exploring the World of Astronomy. This book is another excellent addition to a fantastic series for Junior and Senior High School. In the past, we've used Exploring Planet Earth and Exploring the History of Medicine as read-alouds for everyone. Various kids have used Exploring the World of... Chemistry, Biology, Physics, and Mathematics on their own. I think the only book we haven't used is Exploring the World Around You. I might need to rectify that. Think you know all there is to know about our solar system? You might be surprised at some of the amazing details that you find when you begin Exploring the World of Astronomy! From the rugged surface of the moon to the distant and mysterious constellations, this book provides an exciting educational tour for students of different ages and skill levels. Learn about a blue moon, the 400-year storm on Jupiter, and what is meant by "the zone of life." Discussion ideas, questions, and research opportunities help expand this great resource on observational astronomy into an unforgettable educational course for middle school to high school students! We've been using this book to study astronomy as a group, so I have two high school students (11th and 9th grades), a middle school student (7th grade) plus two elementary students (4th and 2nd grades) doing this together. The littles are supposedly outside the age range for this product, and they certainly are not grasping everything -- especially in some of the more math-intensive chapters -- but they love it too. What I've found wonderful about this book (besides how easy it is for me to use with everyone) is that it is constantly talking about what you can see in the sky, or what you can see using pretty low magnification (binoculars, for instance) in addition to showing some great images from high-powered equipment. Exploring the World of Astronomy has emphasized observational astronomy: what we can see with the unaided eyes, binoculars, and small telescopes. Known facts are emphasized. Before dwelling on theoretical discussion or speculation, it is best to first see what is actually visible. Nothing substitutes for observing the stars in the dark vault of the heavens. Surprise and delight often accompany the first good, clear view of a star cluster, contrasting double stars of blue o gold, or a misty nebula. Yes. That is what I was trying to express before. I love that this book has such an emphasis on what we can see for ourselves. I polled the kids too, to see what it was that they most liked. Connor stated, "I think the pictures complement the text very well. There aren't too many images, but it isn't too heavy on text either. I love all the charts. All kinds of great detail. About real facts. 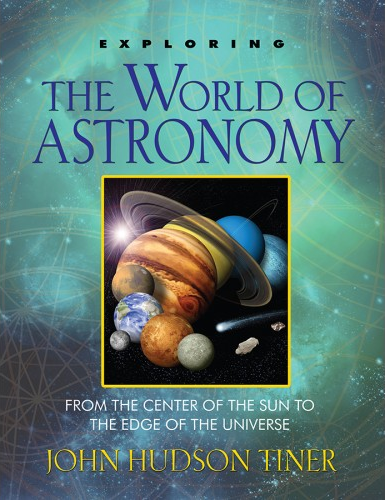 This is a great overview of the subject of Astronomy." William and Thomas commented about how they really like the historical portions of this, such as how the planet was discovered, or how they found the moons or figured out what type of terrain it had. Thomas added, "It amazes me that they (the Greeks and Romans) knew about all of these planets and they named them so appropriately, like Jupiter being the king of the gods, and it turns out that Jupiter is also the biggest planet." Richard's comment was "I like the lore about the planets -- like the stories about aliens on the moon or Mars, and all that about what people used to believe." At the end of the book, there are even more "Explore More" suggestions. There is something there to suit almost anyone. There are questions that relate to literature, geography, geology, math, art, and of course, science. Telling my kids to pick their own project is great when there are so many options available. I recommend this book highly. I certainly am learning a lot from it. You can go see what other Moms of Master Books have to say about Exploring the World of Astronomy! There is a Book and a Treat Facebook party coming up October 22 at 9 pm EDT, where you could win cool prizes including (I assume) this title -- and discuss the book too. This looks like a great read!! I have got to check this out. Thank you soooo much! !